Blockchain technology or popularly known as "blockchain" is a formation of distributed database holding records of all the transactions and digital identity of the execution of any event among the participating entities and is shared across the distributed database. The blockchain technology market is getting widely accepted among major countries including the U.S. and Europe. Currently, in India, blockchain technology market is at a niche stage, however, it is likely to register higher growth over the coming years. This growth would be primarily due to surging demand for secured database for information among several applications in the country. According to 6Wresearch, India blockchain technology market size is projected to grow at a CAGR of 58% during 2018-24. Over the past few months, especially in last quarter of 2017, blockchain technology registered rising end-customer acceptance towards the adoption of this solution, especially among banking and financial services, transportation, and government verticals. In addition, during the forecast period, the market is projected to be driven by rising adoption in BFSI vertical. The banking institutions are expected to register the highest growth of India Blockchain Technology Market share in future. Moreover, the solution is further anticipated to register higher growth among several verticals as it offers transparent, faster, secure, and cost-effective alternative as compared to conventional database solutions. Some of the key players in India blockchain technology market include- Zebi, Primechain, Krypc, Accubits and IBM, and Ernst & Young. 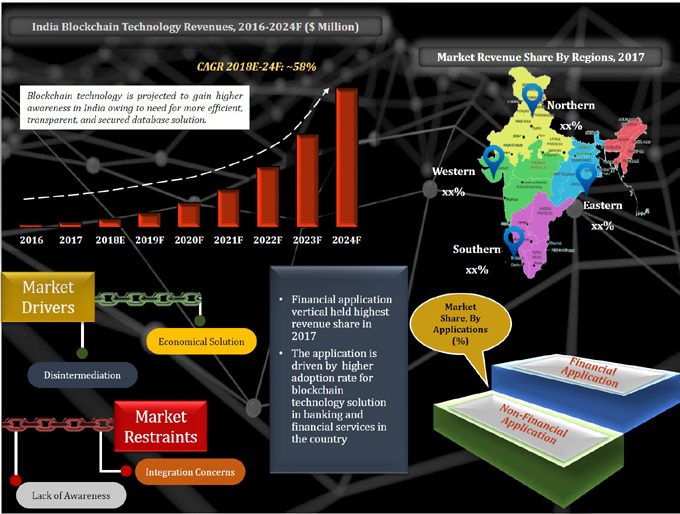 The India blockchain technology market report thoroughly covers India blockchain technology market by type, applications, end users, and regions. The India blockchain technology market outlook report provides an unbiased and detailed analysis of the India blockchain technology market trends, opportunities, high growth areas and market drivers which would help the stakeholders to device and align their market strategies according to the current and future market dynamics. 11.1	Zebi Data India Pvt. Ltd.
11.2	Primechain Technologies Pvt. Ltd.
11.3	Krypc Technologies Pvt. Ltd.
11.4	IBM India Pvt. Ltd.
11.5	Microsoft Corporation (India) Pvt. Ltd.